On Tuesday, September 11, a car owner in Dongguan was contacted by local police and informed that a one-meter-long, venomous pit viper had been spotted under the hood of his vehicle. (The reptile's tail was dangling down the front of the car from under the hood). According to chinanews.com, Mr. Zhu, the car owner, received a phone call from the Houjie Police Station at around 9am. 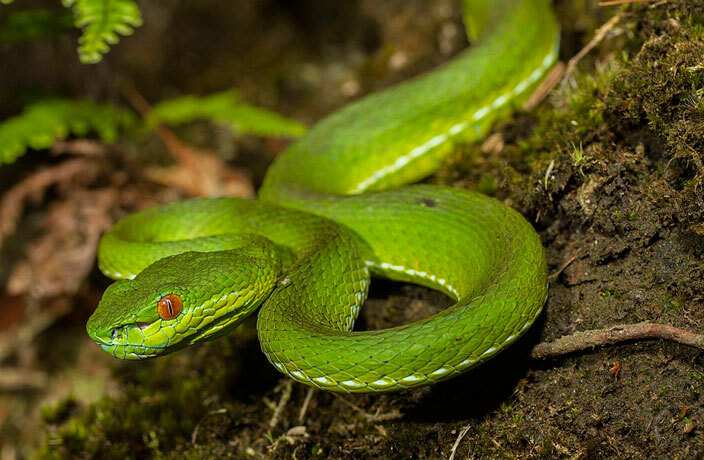 He was told a Chinese green tree viper (trimeresurus stejnegeri) had been found in his car and that he should return to his vehicle immediately. After arriving, Zhu called the local fire department for assistance. It took the Second Fire Brigade of Houjie Town almost half an hour to capture the venomous reptile, which was hiding in the engine compartment. First responders suggested turning on Zhu's car, believing the heat from the engine would drive the creature out of its new hiding spot. Xie Zhiqiang, deputy fire chief of the Second Fire Brigade of Houjie Town, said that the reptile would be handed over to Dongguan's forestry department and be released back into the wild. According to chinanews.com, Zhu suspected that the snake most likely slithered into his car after he parked it in “a grassy spot” at a farmstead a few days prior.